Brand: Lucks Food Decorating Company LK-43597 Units: 1 Image measures 6 1/4" x 6 1/2". Looking for a quick and easy way to decorate a cake? Try the Edible Image! 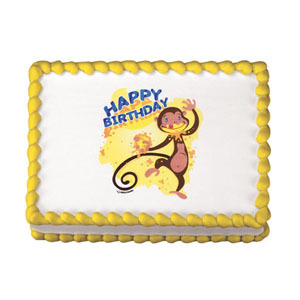 The Edible Image is an edible picture that can be peeled off of its backing and placed directly on the cake. It is best to apply the image onto slightly wet buttercream, whipped icing, fondant or royal icing. Pipe a border around the image or simply leave as is. To ensure longevity, it is best to leave the image in the sealed package until you are ready to use it. To release the image from the backing, run the backing on the edge of the counter in all directions. Then, slowly peel the image off of the backing and place it onto the cake. The image is right side up so there is no need to flip the image over when placing it on the cake. For the most visible results, place Edible Image on a light colored background. Image measures 6 1/4" x 6 1/2". Ingredients: Tapioca Starch, Corn Syrup Solids, Microcrystalline Cellulose, Sugar, Water, Canola Oil, Glycerin, Titanium Dioxide, Polyglycerol Esters, Modified Corn Starch, Algin, Hydroxypropyl Methylcellulose, Mica, Citric Acid, Potassium Sorbate (Preservative), Coconut Oil, Soy Lecithin, Locust Bean Gum, FD and C Blue 1 Lake, Red 40 Lake, Red 3, Yellow 5 Lake, Yellow 6 Lake. Contains Soy. Please note that this product is heat sensitive and creates the possibility of being affected by warmer temperatures. If any damage does occur during transit, leave image out at room temperature, do NOT put in the refrigerator. Purchasing cold packs and expediting the order may reduce the chance of heat damage. We do recommend shipping orders that can be affected by heat on Mondays or towards the beginning of the week so the product is not sitting in a warehouse over the weekend. Please be advised: Ice packs only have a significant benefit in the first 24-36 hours and only when shipping in moderate temperatures. ALL FOOD PRODUCTS ARE NON-REFUNDABLE EVEN IF AFFECTED BY HEAT.